Get a Kindle Fire HD for Just $129! Wow! There’s another surprise discount from Amazon — this time on the high-definition version of their Kindle Fire tablets! Normally the 7-inch model costs $169 — but Amazon’s lowered its price to just $129! And Amazon’s also offering big discounts on their super-high-resolution Kindle Fire HDX tablets. But if you look carefully, you’ll see that Amazon’s big 8.9-inch version of the Kindle Fire HDX has also been discounted by $40 — to just $339! And the 7-inch Kindle Fire HDX has also been discounted, to just $199. Both these devices come with all the high-end special features — like a built-in camera and Amazon’s special “Mayday” button for live customer support. The only catch is it’s a “limited-time offer”. Amazon hasn’t said when these discounts will end, but if you’re already looking for a high-definition Kindle, this is a good way to save some money. Amazon sent me a promotional e-mail about the discounts on Sunday,tying the promotion to the NCAA “March Madness” playoffs. “Watch Every Game Live” reads a headline one the tablet. 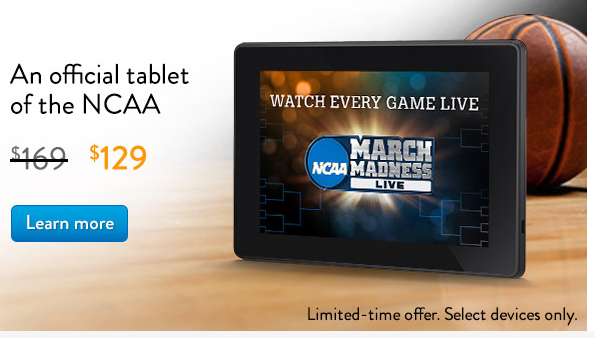 And apparently, these Kindle Fire tablets are “an official tablet of the NCAA”. But it’s a promotion that makes sense, since this is the one time of year when sports fans plan on watching lots of end-of-the-season basketball games. So if you’re going to be watching them anyways, why not watch them in high-definition video on your handheld Kindle Fire tablet? The whole month of March is “National Reading Month” in America — and Amazon has set aside a special collection of books to celebrate. “What Will You Read This Month?” asks the headline on their special web page — which links to Amazon’s picks for “The Best Books of the Month.” So what books did Amazon choose for honoring National Reading Month? “They say she found a way to come back to Oz,” reads a warning on the back of this book’s cover. “They say she seized power and the power went to her head. And now no one is safe…” It’s an exhiliarating act of imagination — or re-imagination — and author Danielle Paige turns it into a thrilling 464-page fantasy novel. 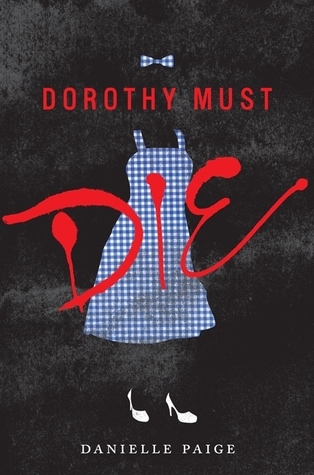 She delivers a fresh new story about Amy Gumm — “the other girl from Kansas” — who must stalk that dreaded scarecrow and overcome all of Dorothy’s other allies. “I’ve been recruited by the Revolutionary Order of the Wicked…. And I have a mission.” It looks like a great read! 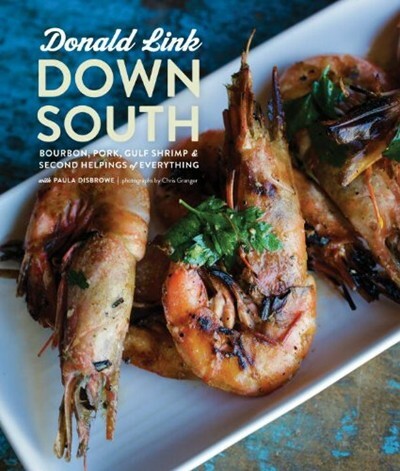 He’s an award-winning chef from New Orleans, but according to the book’s description on Amazon, Donald Link “also has a knack for sniffing out a backyard barbecue wherever he travels.” His new book offers 110 recipes (and 100 color photographs) — but also interviews with barbecue “pitmasters”, and visits to colorful southern characters. (Like a Mississippi honey-grower to a Texas lamb ranch with their own pet llama!) This book offers a loving look at some great southern food — everything from slow-cooked barbecue pork, fresh Gulf seafood, Kentucky bourbon. But besides all of the welcoming treats, there’s also a fun look at the people who are cooking them! 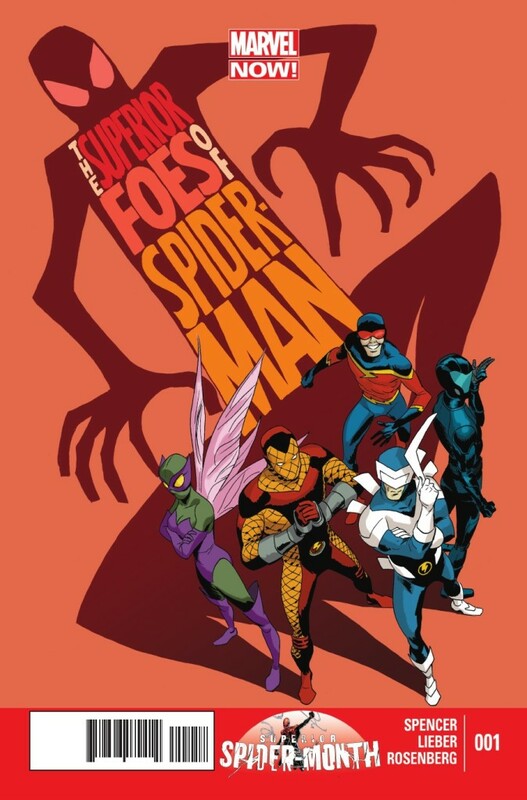 Although Amazon’s Kindle Store does have nearly 200 other Spider-Man graphic novels to choose from! Is that BBC’s “100 Books” List A Giant Hoax? “The BBC believes you only read 6 of these books” reads the headline on one page. “How many have you read?” It’s followed by a list of 100 literary classics, including Pride and Prejudice, The Lord of the Rings trilogy, Jane Eyre and the Harry Potter series. Book lovers all around the web (and on Facebook) are taking this irresistible quiz, but there’s just one problem with it. It’s a hoax. The BBC never made any such claim. I’ve searched the BBC’s web site, but there’s no mention there of any list of books that they supposedly believe people aren’t reading. With a quick Google search, I found more web pages where people were posting the same list — even as far back as 2009 — and even a couple pages where people were asking the same question I did: why doesn’t the original list anywhere on the BBC’s web site? Finally I discovered an obscure blog post from 2009 where someone in the comments (named Julie) had finally tracked down the answer. The original list apparently dates back to 2007. Instead, their list was titled 100 books that “you can’t live without”. It appears to be based on a poll of their readers, which might explain why the results contain so many British authors. Six of the 100 books were written by Charles Dickens, and four were written by Jane Austen. Yet there’s not a single book by Mark Twain — or Ernest Hemingway, or William Faulkner. But it’s still nice to know that there other people who like some of the same books that I do. (Yes, I have read “The Hitchhiker’s Guide to the Galaxy, as well as The Wind in the Willows…as a free Kindle ebook!) But as I was going through the list, trying to see if I’ve read more than six of its titles or less, I start to wonder if there’s a better way to see if I’m reading enough great books. And the best thing I read today was probably the response from the blogger who first figured out (in 2009) that this challenge was a hoax. “So, feel free to see how many of those hundred books you’ve read,” Julie writes. “As a reader, I always find it fun. “However, know that the BBC isn’t judging you. It’s almost an even bigger surprise. Amazon announced their picks for “100 Books to Read in a Lifetime” (as chosen by the editor’s of Amazon’s book section.) But deep within Amazon’s press release, they also revealed which books their editors most wished had made it onto their list — but didn’t! The results are a surprisingly eclectic collection of new and classic fiction. And Amazon’s also published an entirely different list of “100 Books to Read in a Lifetime” — this one chosen by actual readers! “We set out to build a roadmap of a literary life without making it feel like a homework assignment,” explained Amazon’s editorial director for Kindle ebooks (and printed books) at Amazon.com — and I like how they let other readers participate in the list building. 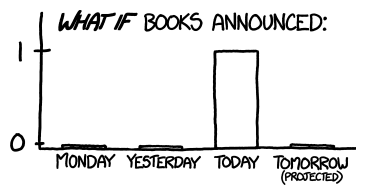 But it was also fun just to hear about which books had received the most votes. In fact, Amazon’s press release, Amazon identifies six books where the decision was unanimous. Each one of Amazon’s editors felt these books should be included on their “lifetime” list. Only the last two are available in Kindle editions (which might explain why Amazon was reluctant to include them on their list). But when preparing their press release, Amazon had also asked each editor for their own personal pick of a book which they’d most wanted to include — and the results were very surprising. The books are from different centuries, with authors from different countries, writing about different themes, and for audiences at different reading levels. This list made me smile, since each one is a purely personal pick, a collection of “beautiful losers”, if you will — each one fondly remembered by somebody. But fortunately, Amazon has also published a second list of books for a lifetime, an entirely different selection that was chosen by readers! The polling happened on the GoodReads web site, and in this case, it’s “readers to the rescue”, since this second list does include some of those “beautiful losers” that didn’t quite make it onto Amazon’s own list. The Hitchhiker’s Guide to the Galaxy came in at #28 on the “reader’s list”, and Les Miserables came in at #69. And the readers at GoodReads also came up with some original choices of their own! One of my favorite science fiction book’s make it onto the “reader’s list” — Ender’s Game by Orson Scott Card, which came in at #57. And the reader’s also chose The Girl with the Dragon Tattoo (#45) and Stephen King’s The Stand (#53) — plus A Game of Thrones (A Song of Ice and Fire, Book 1), which ranked #64 in the voting. Even an Agatha Christie mystery made it onto the list — And Then There Were None, in the #85 spot. This definitely feels like a list of books that’d be fun to read. If there’s a theme running through this list, it’s the kind of books that you’ve probably seen your friends reading. Besides agreeing with Amazon’s choice of The Lord of the Rings, the “reader’s list also included The Hobbit. And where Amazon had included Harry Potter and the Sorcerer’s Stone, the readers at GoodReads picked three more books about the boy wizard — Harry Potter and the Deathly Hallows (#42), Harry Potter and the Prisoner of Azkaban (#62), and Harry Potter and the Half-Blood Prince (#72). Amazon had also included The Hunger Games, but the “reader’s list” went ahead and added the other two books from the series — Mockingjay and Catching Fire. Part of the fun of this exercise is knowing that we all have our own favorites. (That’s why we get so excited when we spot one that made it onto somebody else’s list.) But sooner or later we’ll have to look outside our own bubble, and that’s when the real fun begins. If you were looking for new books to read, which list would you choose? I was surprised to discover that some of the books are available for free, and I was glad Amazon’s list included On the Road by Jack Kerouac — as well as Slaughterhouse-Five by Kurt Vonnegut (another personal favorite of mine). At first I was a little surprised that they’d also included Fear and Loathing in Las Vegas, Hunter S. Thompson’s “gonzo” memoir about taking a “Savage Journey to the Heart of the American Dream”. But then I re-read the book’s first paragraph, and remembered what an intense read it had been. That explains how their list came to include Stephen King’s The Shining and Valley of the Dolls by Jacqueline Susann. 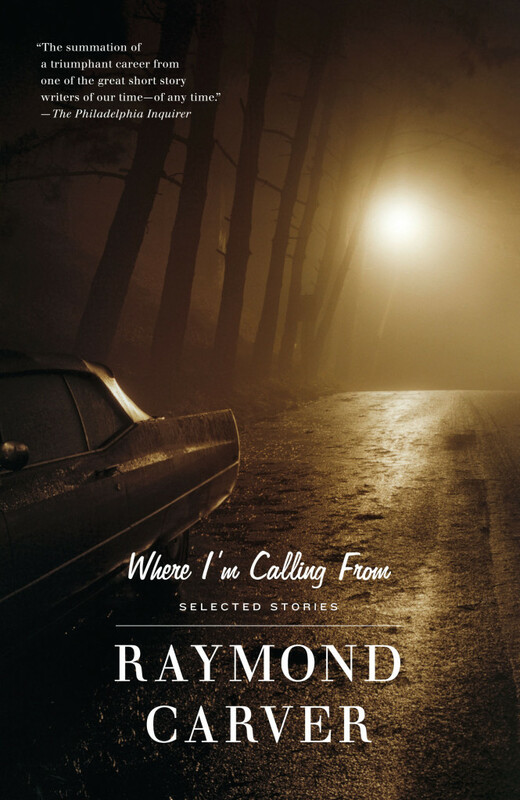 (Though I’m glad they also included Raymond Chandler’s classic noir detective story, The Long Goodbye. ) Other “fun” titles include David Sedaris’s Me Talk Pretty One Day and Kitchen Confidential by chef Anthony Bourdain. And there’s even some “blockbuster” fantasy and science titles – as well as some classics! Kindle versions are available for most of the books — but not all of them. (That’s one of the list’s biggest surprises.) In fact, 17 of the 100 “books to read in a lifetime” that Amazon recommends are only available in print editions. But there’s also six classic novels on their list which are not only available on the Kindle — they’re free. A list like this will always provoke a discussion. (For example, I’m glad Amazon included Michael Lewis’s Moneyball, but that same author wrote a memoir about his high school baseball coach which I thought was much more inspiring…) But the real point of a list like this is to pique our curiousity about what other great books may be waiting for us out there that we haven’t read yet. Amazon’s introduction to the list sums it all up with just six words. Can This eBook Make Us Immortal? 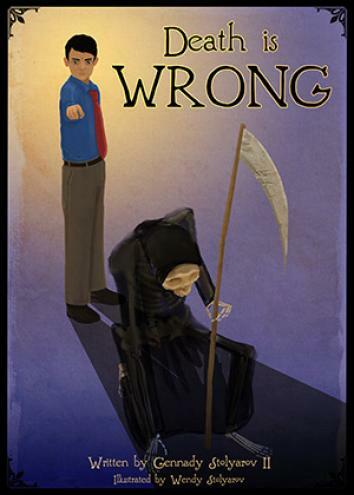 “Death is Wrong.” Hoping to inspire life-extending medical research by future generations, science fiction author Gennady Stolyarov has also launched a campaign to give away 1,000 free copies of his “transhumanist” picture book to children. “My greatest fear about the future is not of technology running out of control or posing existential risks to humankind,” he writes in an online essay. “Rather, my greatest fear is that, in the year 2045, I will be 58 years old and already marked by notable signs of senescence, sitting at the kitchen table, drinking my morning coffee, and wondering, ‘What happened to that Singularity we were promised by now? Why did it not come to pass? It’s mind-blowing to even imagine a world where death can be cured just like any other disease. And it’s really inspiring that self-publishing gave this dreamer his platform — so he can share his ideas with the rest of the world. Who knows? Maybe he could inspire medical miracles by the next generation. And the Kindle didn’t just provide a platform for this author’s ebook. 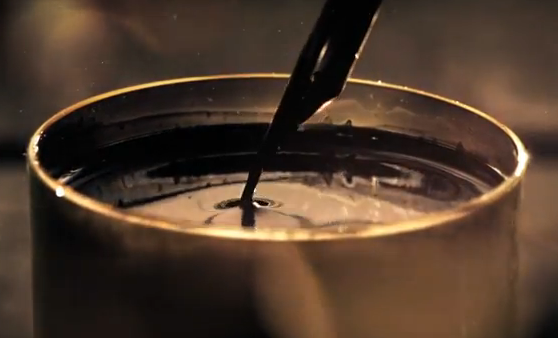 It’s also helping to fund the construction of a powerful clock that will run for 10,000 years! The project has other influential backers, according to Wikipedia, including science fiction author Neal Stephenson and musician Brian Eno (who came up with the name “Clock of the Long Now”.) It makes me smile if only because they’re dreaming big dreams, and that’s partly why the clock is being built. “Ideally, it would do for thinking about time what the photographs of Earth from space have done for thinking about the environment,” writes futurist Stewart Brand on one of the project’s web pages. “Such icons reframe the way people think. For years the cartoonist — Randall Munroe — has been fielding these wild questions on a special “sub domain” of his comic strip’s web page ( at whatIf.xkcd.com ) The answers are illustrated with some of his endearing stick figures and simple diagrams – but there’s always been real science in the paragraphs of text that accompany them. What’s really amazing is he only announced his plans to publish this book yesterday — in a blog post entitled “What if I wrote a book?” His fan base was so thrilled, a huge number apparently rushed over to Amazon to pre-order their copies! To encourage them to buy, the author even created a special cartoon just to answer one more question. But there’s one more fascinating data point. 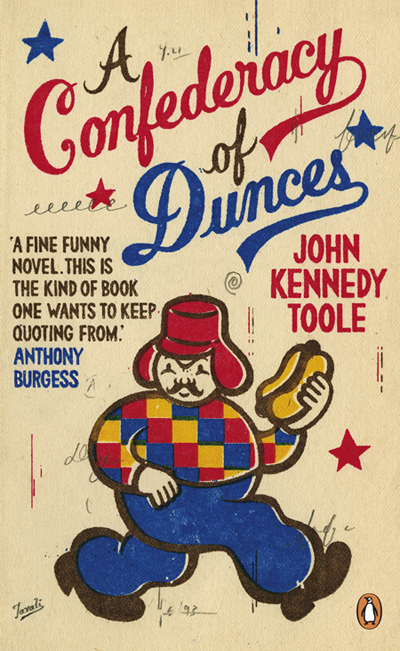 Right now, the unpublished book doesn’t even appear on Amazon’s list of the top 100 best-selling Kindle ebooks. It’s got me wondering if most of Amazon’s customers are just buying Kindle ebooks now. So it’s much easier to get to the top of Amazon’s list of print best-sellers — because Amazon’s selling so few printed books! Who’s That Woman in The Blue Bikini in Amazon’s Kindle Ad? I was really proud after identifying which novel Amazon was showing being read in their latest Kindle commercial. (It’s Gone Girl, the best-selling 2012 thriller by Gillian Flynn.) But one of my readers had entirely different question. “I am more interested in who that woman is enjoying the book,” they e-mailed me last week. Here’s your answer: it’s Anna Zielinski, and she used to be a professional cheerleader! For two years she cheered on the San Antonio Spurs, an NBA basketball team, as one of their “Silver Dancers” — until she switched to career in acting. She’s appeared in various episodes of lots of different TV shows — including Bones, Castle, Without a Trace, Lie To Me, and How I Met Your Mother. Ironically, in 2005 she had a small part in Samuel L. Jackson’s movie about a basketball coach — in which appeared as a cheerleader! But now she’s best-known just for reading ebooks. “Anna Zielinski is the face – and body – in some of Amazon’s Kindle ads…” begins a profile in Business Insider. She always appears reading in a bikini — which is usually black — and in her first ad she teased an iPad owner who couldn’t read its screen because of the sunlight. “Poolside Girl in Kindle Ad Plunges a Nation Into Civil War,” joked a headline at CBS Moneywatch, which noted that within two days the ad had racked up nearly 1 million views just on YouTube (after it received a high-profile link from the technology blog Engadget ). But I’d blame that 2010 controversy on the commercial’s script, which Zielinski delivered perfectly. She gently reminded the poor iPad owner that her own beach-friendly Kindle had only cost her $139. I’m fascinated by the Kindle, and the way that it’s actually revolutionized how we’re reading and purchasing books. But Amazon’s always been very cautious as they’ve introduced this device into our world. For years their TV advertisements have worked very hard just to seem casual and relaxed, offering only a few simple lines of narration (often with fun and funny visuals). The real key to Amazon’s ads might be their music — which give each spot its special friendly and playful tone. So which songs did Amazon choose to represent the Kindle? A plane is making a loop. The beavers are so cute. I’d first refered to this as Amazon’s “Secret Summer Commercial,” since it first aired in England in the summer of 2012, showing “lots of happy people enjoying their Kindle while they’re ‘on holiday’ at the beach.” The first words on the screen are “Pack Your Kindle,” before a montage of cheerful scenes shows scenes from a fancy summer resort (all of which include a Kindle) — like a tall glass of lemonade on a table, or a woman reading by the pool. When they fight, they fight! Or too little too late? He got the message she left on his car, in the rain. to find what you’re looking for? like the sun, make it glow, or they glare at me. keep me up at night. So just hold up. Don’t fold up. You’ll see there’s no end. And if the waves ride high, then so will I. Before you know, before you know, before you know, you’ll know. And you’ll see them again. Monday was “Read Across America” Day, a special event where schools (and schoolteachers) take time to celebrate the joys of reading. Last year movie star Uma Thurman read The Cat in the Hat to more than 250 schoolchildren to promote the event (which saw over 45 million schoolchildren participating!) Every child in Manhattan got a free copy of The Cat in the Hat as part of the special celebration. 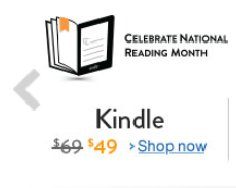 But today, Amazon’s celebrating the joy of reading by giving big discounts on their most popular Kindles! The $20 discount for Amazon’s smallest Kindle comes out to a 28% savings (since it’s usually priced at $69). But the Paperwhite has consistently been one of Amazon’s more popular Kindles, so it’s nice to see Amazon’s also lowering its price. Remember, this sale is for one day only. 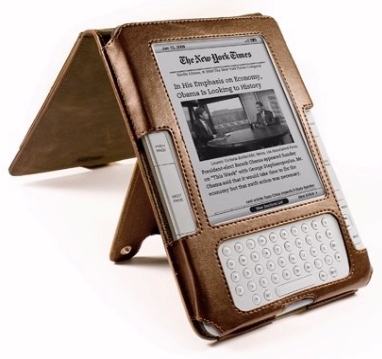 So if you’re in the market for another Kindle — and you want to save $20 — today’s your day! 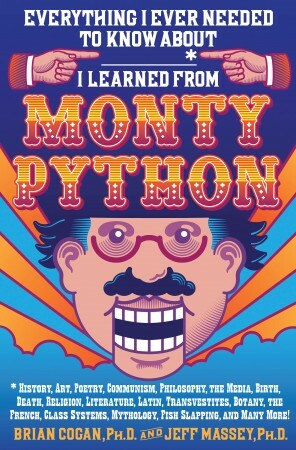 Amazon Discounts More eBooks to $3.99 or Less! I love the beginning of each month, because it’s when Amazon announces new discounts on a special selection of Kindle ebooks! It’s one of the best things about being a Kindle owner — there’s always plenty of bargains to explore, which makes it easy to try out new authors and explore some new genres. And this month, Amazon’s discounted some relatively new ebooks — including an Agatha Christie story that’s never been published before! It’s a new, never-before-published mystery by Agatha Christie — and it’s available only as an ebook! Just released in November, this novella was originally authored in 1954, and it holds a special place in the Agatha Christie canon. She slipped in references to her own local neighborhood into this story — including her very own home of Greenway — and she’d planned to donate the money earned by this story to her own local church’s fundraiser for a stained glass window. But in the end, the novella itself took a strange turn, according to the book’s page at Amazon, when Christie decided to enlarge its 75-page story into a longer, full-length mystery (which she released in 1956 as Dead Man’s Folly ). Instead the church received the proceeds from another mystery story featuring her Miss Marple character. And now the original novella version of this Hercule Poirot mystery has finally also been published! Isabel Allende wrote the novel “House of the Spirits” in 1982, and she’s also won numerous awards, including induction into the American Academy of Arts and Letters. But just three years ago, at the age of 68, she applied her “magic realism” to the city of New Orleans, delivering this rich piece of historical fiction that’s set in the late 1700s. “Allende is a master storyteller at the peak of her powers,” reads a quote from the Los Angeles Times on the book’s page on Amazon. It’s exciting that Amazon’s included this among this month’s selections for discounted Kindle ebooks. But I was really surprised they included it in the “Romance” section — “What the Duke Desires” and “How to Discipline Your Vampire”! Last year I wrote wryly about how Amazon had discounted five different romance novels which all contained the word “Duke” in their title! But give some credit to Sabrina Jeffries, who has was chosen last month to be the first romance author interviewed by USA Today for their new column about historical romance novels. Her historical romance novels reached the New York Times best-seller list — she’s written 36 of them, with titles like Never Seduce a Scoundrel and Married to the Viscount. Fans of historical romance will be pleased that a new Jeffries novel was released just six weeks ago — When the Rogue Returns — and that Amazon has discounted her previous novel to just $1.99!